I feel that it’s only natural to continue with the fortune teller theme using tarot cards as the emblem of visibility. 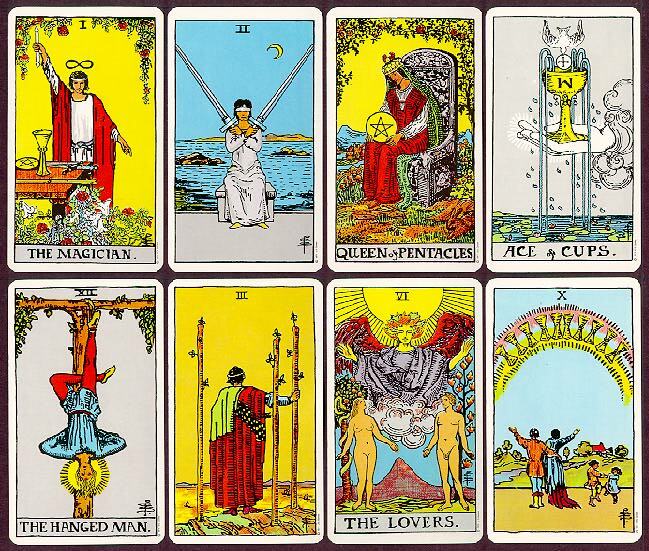 Tarot cards contain only pictures on one side. This leaves them at the mercy of their interpreter. Once again, one must have the ability to create a story from what they see. Cards can be interpreted in different ways. For example, death doesn’t necessarily mean death of the body but it can be a transformation of the soul or a rebirth, if you will. True, with these loose interpretations, the cards will always be right. What is more important than the future being told is the precise way in which someone reads the cards, intelligently and creatively. Like Calvino as a young boy making up stories for pictures without words, the tarot card can be interpreted however the reader pleases. Calvino’s quality of visibility can be compared to a fortune teller. I have come to this conclusion based on how a fortune teller makes predictions. I prefer to take a logical approach to this practice and acknowledge that a fortune teller must be trained in this profession. They ask their client a question, then make a prediction of the future based on their response. If they get a positive reaction, they continue on in that direction. 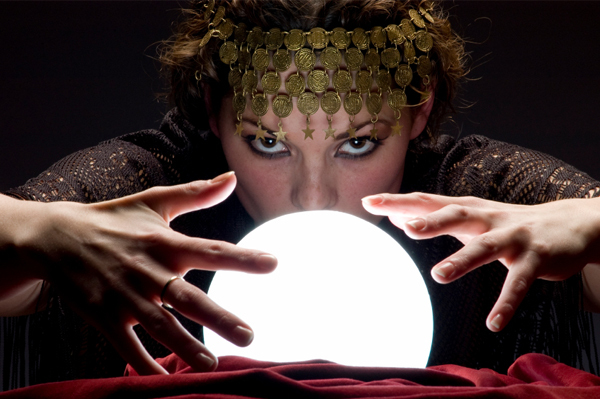 If they make a wrong prediction, they tweak it slightly until it fits the client’s needs. A fortune teller must be sensitive to emotions, a good listener, and have a good imagination. This is like visibility in that she creates an image in her mind based on her client’s words. She then responds verbally and the client’s imagination is let lose to dream. The fortune teller is able to build on what they are given. Even in “Girls Day Out,” the e-lit example, we’re able to draw some conclusions from the information given to us. We don’t always need both audio and visual to create a scene for us like a movie. Time and motion refer to the movement within the E-lit work and how it effects the perception people have of it. Time and Motion are closely related principles because when any word or image moves it functions both spatially and temporally. Artists try to find ways of creating motion when they are working with a static piece. 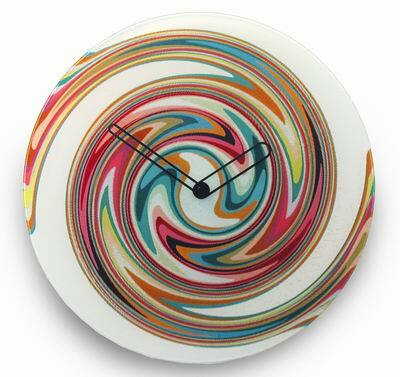 When looking at time and motion as an aspect of design in “Girls day out,” a few things are noticeable. There are pictures on the main screen all-together there are very few. There are, however, plenty of letters. Instead of videos, we watch the letters swarm in “Shards” and they fade out to reveal specific words in the other poem. Other than shifting the placement of the letters, there are color changes. A change of color can also contribute to the appearance of movement. Rather than creating visuals to match the written content, the letters change and move with an eerie feel, representative of the murder and death within the story. Author description: This is a work in Flash format. It contains three separate but related sections: the title prose poem, “Girls’ Day Out”; the author’s note on the poem; and “Shards,” a poem composed from phrases found in articles in the Houston Chronicle that covered the events that inspired the poem. This is a very descriptive story through words but uses few photos. This is an understandable technique since the purpose of this piece is to commemorate the deaths of four girls/ women on land that the author had a connection to. Pictures of dead girls would probably not go over too well with the public. Instead, the author gives us bits from the police report which works equally well to convey the gruesome qualities of the murders. This allows for an imaginative visual process. Calvino describes visibility as two types of imaginative processes: one that starts with the visual image and arrives at its verbal expression and one that starts with the word and arrives at the visual image. Visibility describes the ability to match an image of the imagination with words that describe it. Calvino tells about his youth when he would look at pictures from the Felix the Cat comic strip but not be able to read them. He’d make up his own stories, putting his own words to the vision. Calvino has a visual image to all of his stories. For example, he envisions a suit of armor that moves and speaks as if someone were inside. Once he has his visual, he can set about writing the story. This makes me think of the Choose Your Own Adventure novels I used to read in elementary school. You, the reader, come to a crossroads and must choose what you next action will be. You’re not completely in control of your outcome but your vision changes the results with every choice. 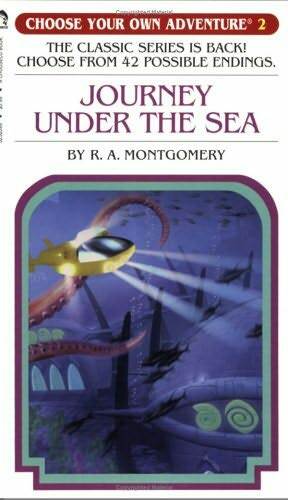 One of the versions I owned was Journey Under the Sea by R.A. Montgomery.